What first jumps out about Caravan of Thieves is the energy. 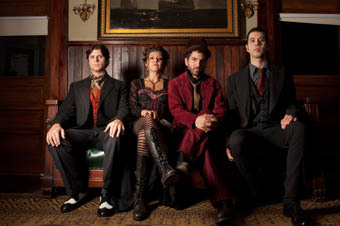 “The group’s gypsy folk-jazz sound oozes with energy,” says the Washington Post. The website blogcritics.org declares that the group has “twice the energy and intensity of any rock and roll band.” This is a quartet that claps, snaps, stomps, and even makes animal noises! They also make crowd-pleasing music, with mesmerizing vocal harmonies and mordantly clever lyrics. Husband and wife Fuzz and Carrie Sangiovanni started as a duo in Connecticut. “We had a romantic, bohemian vision of a couple making music, performing on the road, in parks, traveling around and avoiding responsibility as much as possible,” says Fuzz. In the spring of 2008, Fuzz and Carrie added Ben Dean on violin and Brian Anderson on double bass to their own guitar, vocals, and wild percussion, and the group hasn’t looked back since. They’ve shared the stage with Emmylou Harris, Punch Brothers, the Decemberists, and Iron and Wine, and released three albums, Bouquet, Mischief Night, and their latest, The Funhouse, which Steampunk Magazine describes as “an off-kilter carnival ride you don’t want to miss.” They recently appeared on Mountain Stage, and we’re delighted to have them here at the Freight!